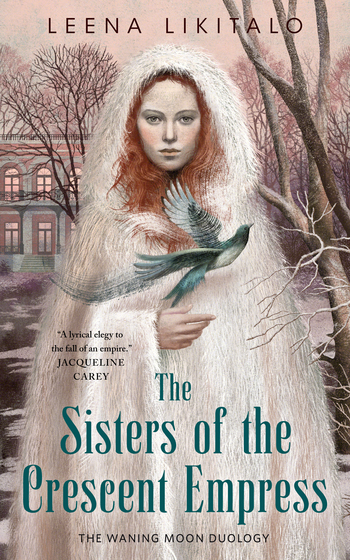 The Sisters of the Crescent Empress is the second book in Leena Likitalo's Waning Moon Duology, a fabulous historical fantasy based on the lives of the Romanov sisters. With the Crescent Empress dead, a civil war has torn the empire asunder. No one seems able to stop the ruthless Gagargi Prataslav. The five Daughters of the Moon are where he wants them to be, held captive in an isolated house in the far north. Little Alina senses that the rooms that have fallen in disrepair have a sad tale to tell. Indeed, she soon meets two elderly ladies, the ghosts of the house's former inhabitants. Merile finds the ghosts suspiciously friendly and too interested in her sisters. She resolves to uncover their agenda with the help of her two dogs. Sibilia isn't terribly interested in her younger sisters' imaginary friends, for she has other concerns. If they don't leave the house by spring, she'll miss her debut. And while reading through the holy scriptures, she stumbles upon a mystery that reeks of power. Elise struggles to come to terms with her relationship with Captain Janlav. Her former lover now serves the gagargi, and it's his duty to keep the daughters confined in the house. But if the opportunity were to arise, she might be able sway him into helping them flee. Celestia is perfectly aware of the gagargi coming to claim her rather sooner than later. She's resolved to come up with a plan to keep her sisters safe at any cost. For she knows what tends to happen to the sisters of the Crescent Empress.